Raoul Dufy made a number of paintings from the small village of Vallauris during the 1920s when he travelled frequently from Nice to the surrounding areas along the Côte d'Azur. Like countless other artists at this time, including Henri Matisse, Dufy was drawn to the unique quality of light in the south. This new vibrant palette greatly impacted Dufy’s practice and helped to formulate the pure colour and fluid, energetic line that characterised his mature style. Following Dufy’s sojourn in Vallauris, the village itself became a centre of creative activity with the first annual ceramics exhibition in 1946 and the arrival of Picasso, who lived in the village from 1948 to 1955. ‘La Terrasse à Vallauris’ is one of several paintings that capture the panoramic views of the coastline, gardens and aquamarine sea from a pavilion overlooking the village. 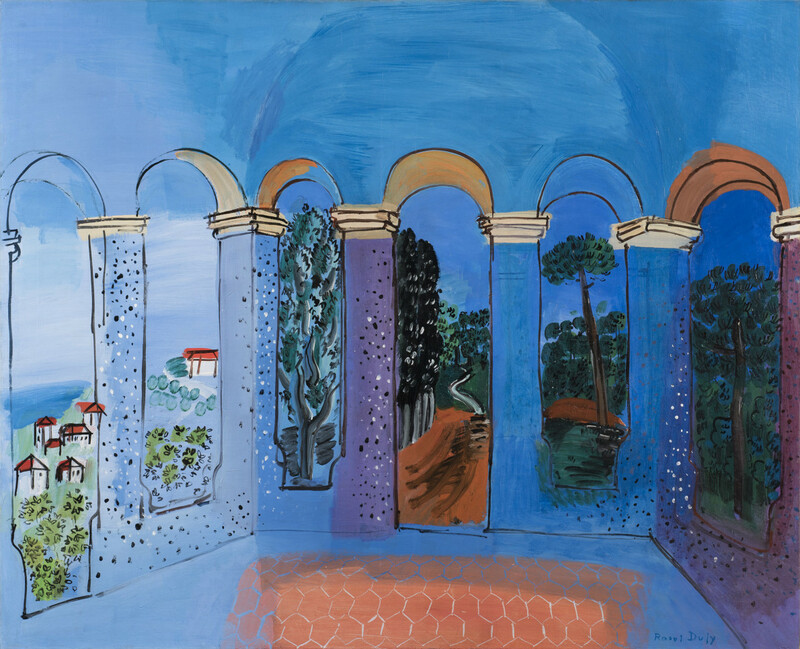 In each of these works (an example of which can be found in the Bührle Foundation, Zürich), Dufy highlights the columns and archways in a rich cerulean blue that seeps beyond the outlines of the structure to evoke the radiant warmth of the south. As Gertrude Stein, the poet, writer and art collector explained, “Dufy is pleasure. Think of the colour and it is not that and the line and it is not that, but it is that which is all together and which is the colour that is in Dufy”. Having recently returned from his travels to Morocco in 1926, the arched vistas of the Vallauris terrace and details such as the patterned tiles and multi-coloured dots also reveal the artist’s new-found interest in oriental decoration. ‘La Terrasse à Vallauris’ was previously in the collection of the legendary German art dealer Alfred Flechtheim.